“Zombinion” is a BGE digital boardgame conversion and complete re-theme of the “Dominion” boardgame, by Donald X. Vaccarino (published by Rio Grande Games in 2008). It is played using the rules from Dominion, which can be downloaded from the Rio Grande Games website (direct download links are provided in the accompanying ReadMe file). “Zombinion” changes the “Dominion” game setting from one of empire-building in a medieval/fantasy world to one of zombie-killing in a post-apocalyptic world, and it does so without changing (or adding) any game rules. In Zombinion, each player starts with an identical, very small deck of cards. In the center of the table is a selection of other cards the players can “buy” as they can afford them. 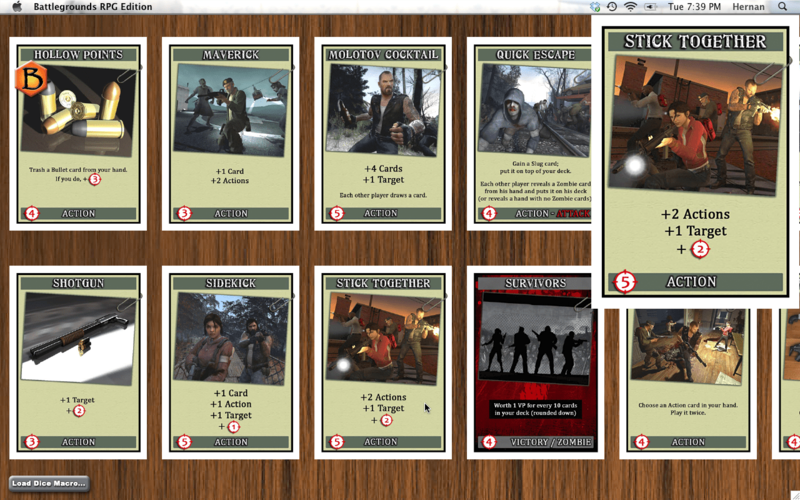 Through their selection of cards to buy, and how they play their hands as they draw them, the players construct their deck on the fly, striving for the most efficient path to the precious victory points (zombie kills) by game end. 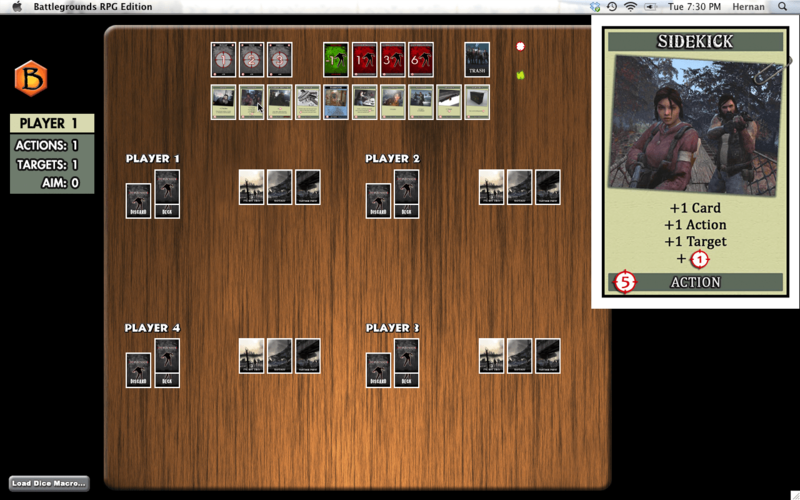 Zombinion is not a CCG, but the play of the game is similar to the construction and play of a CCG deck. 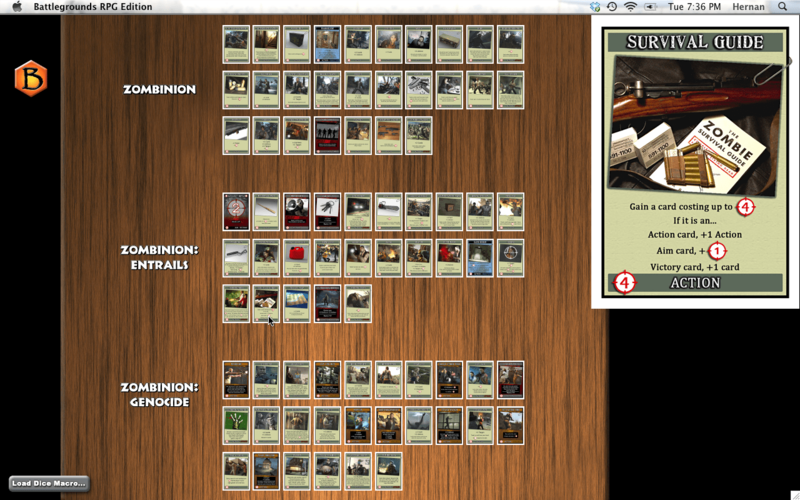 You select 10 of the 78 Plan card types to include in any given play of the game — leading to immense variety. This digital conversion covers/supports not only the original “Zombinion” game, but also the follow-on expansions “Zombinion: Entrails” (the re-theme of “Dominion: Intrigue”) and “Zombinion: Genocide” (the re-theme of “Dominion: Seaside”). Here are some screenshots of what the game looks like in Battlegrounds (they were actually taken in BRPG, but the game looks the same in BGE). 1) An internet connection is required to use and/or play this game conversion. 2) This free game conversion differs from other game conversions I’ve done in that it may not always remain available for download, and even if you already downloaded it, it may cease to work. There is a “kill switch” in place just in case Rio Grande Games has a problem with this game conversion (not very likely, since this is a re-design with all-new artwork, and I am not including the game rules).